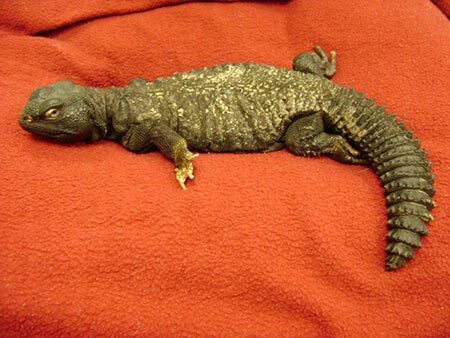 Gingko is a beautiful Egyptian Uromastyx who has lived with his owner for 5 ½ years, mostly roaming free in an apartment. His owner brought him here after he noticed that Gingko was eating less and losing weight over a period of several weeks. He was also lethargic and not acting like his usual self. Uromastykes are native to Northern Africa, the Middle East, and Asia and eat a variety of plants and occasional insects. They love to bask in the sun during the day and can tolerate temperatures up to 120 degrees. They are known for their large, spiked tails, and are often referred to as “spiny-tailed” lizards. On physical exam Gingko was quiet, but alert. 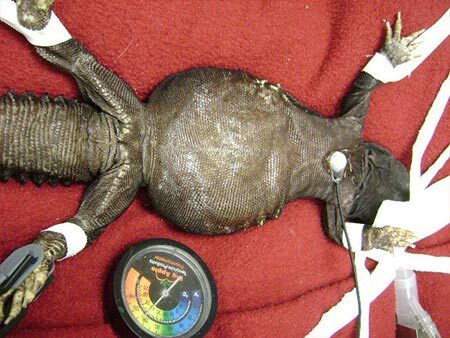 He was moderately dehydrated and had some areas where he was having trouble shedding his skin. Lethargy, decreased appetite, and dehydration are common clinical signs in reptiles that are ill with many different diseases ranging from infections to cancer. It was not until we took an x-ray of Gingko that we were able to figure out what was making him sick. 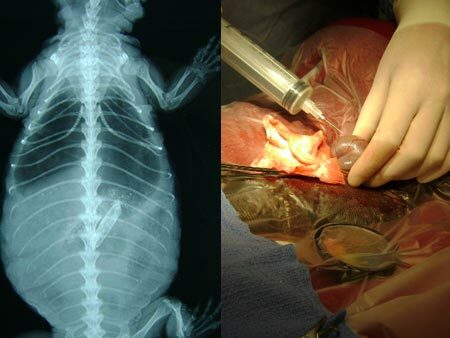 Gingko had a 2cm long foreign object in his digestive tract. The owner did not recognize the object on the x-ray, but because Gingko was loose in the apartment he could have easily swallowed something that was on the floor. Due to the large size of the object, the only option was to surgically remove it from Gingko’s digestive tract. There are many theories about why reptiles swallow things that aren’t food. Here at the Center we have performed surgery on hundreds of animals suffering from this unfortunate problem. One theory is that in captivity we are unable to provide the exact kind of diet and environment needed by a reptile, so they eat things because of underlying nutritional deficiencies. Sometimes it seems accidental, or may result from curiosity in “tasting” something that looks like food. Gingko was a very lucky lizard and is now back at home doing well. His owner now knows to keep a much closer eye on him while he is out of his tank. While all reptiles deserve some time out to explore and get exercise, it should be done under direct supervision. When you are not able to be with your pet reptile, they should be housed in a safe and comfortable enclosure. The staff here at the Center is specially trained to answer questions about appropriate reptile enclosures. If you have any questions about lighting, temperatures, humidity, size, and safety of cage accessories please call us and schedule an appointment.